Your investment may need to fund certain programs and initiatives in perpetuity (100 years). 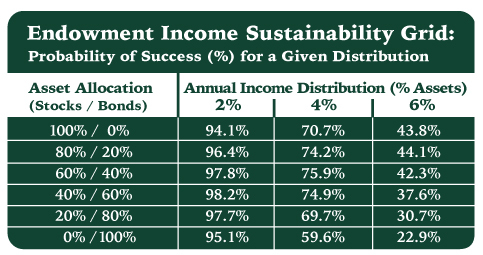 The Endowment Income Sustainability Grid shows the probability of success – the odds that your portfolio will be sustainable and continue to provide what is needed – for given combinations of income distribution and asset allocation. For example, assume a $1 million portfolio with a 4% ($40,000) annual distribution requirement. With a target weight of 60% stocks and 40% bonds, the portfolio has a 75.9% chance of being sustainable (remaining at or above its principal value). In perpetuity, it should continue to provide $40,000 per year (adjusted annually for inflation). The Endowment Income Sustainability Grid is for informational purposes and is based on TriVant’s proprietary model. Our model is a closed equation (not a Monte Carlo simulation) and uses historical data from 1970 – 2014. Model specifics are available by request. A risk of loss is involved with investments in stock markets.